France is ending its military mission in the Central African Republic (CAR), three years after it intervened to stop mass killing after a rebellion ousted former president Francois Bozize. The withdrawal of the 2,000 French troops comes as a fresh wave of killings has rocked CAR. France says Sangaris succeeded in its mission to stop fighting in CAR. 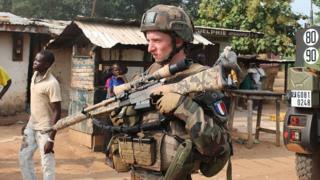 Some 350 French soldiers will remain in the country to provide back up to Minusca, the UN mission in the country. With the end of Operation Sangaris, Minusca will be left in sole charge of security in CAR. Minusca has more than 10,000 troops on the ground but it has failed to disarm militia groups and there have been fresh clashes in different parts of the country. On Thursday, 15 people died in clashes between the mainly Muslim former Seleka rebels and the largely Christian vigilante anti-Balaka group, Minusca said. While six police officers and four civilians died in an ambush on Friday. This came a week after four people were killed during protests calling for the withdrawal of Minusca from the country. France's Defence Minister Jean Yves Le Drian says French troops have had a successful deployment, achieving their aims of ending the fighting, transitioning with the UN peacekeeping mission and ensuring that CAR had peaceful elections. The problem though is that it leaves Minusca alone in charge. Judging by sentiments over time, including last week's anti-UN protests in the capital Bangui, Minusca has little goodwill from the people. It has been accused of not doing enough to protect civilians from militia attacks and of course there are the allegations of sexual abuse by its peacekeepers. CAR's national armed forces remain under an arms embargo until next January and need to be rebuilt to carry out defence and security duties. So the country is still heavily reliant on international support. Armed groups still control large areas of the country and show little sign of fear or respect for Minusca. So it is quite a tall order for the peacekeepers at this point to replicate the strong presence the French forces had.